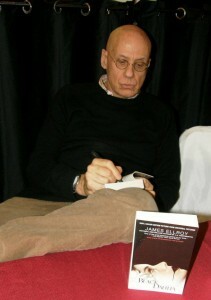 I was recently interviewed by Michael Dooley for Print Magazine. Dooley is the creative director of Michael Dooley Design, and he also teaches design history at UCLA Extension, Loyola Marymount, and Art Center College of Design. The interview is in two parts, and we covered everything from my interest in historic crime to my love of vintage cosmetics ephemera. In part two of my interview with Michael Dooley of Print Magazine, I talk about my collection of vintage cosmetics ephemera, and I also discuss my personality profile of Elizabeth Short (The Black Dahlia) based upon her choice of makeup. I’m pleased and proud to announce that a project on which I’ve been working for the past few months at the Los Angeles Police Museum has been completed and it opened to the public on Monday, March 19, 2012. 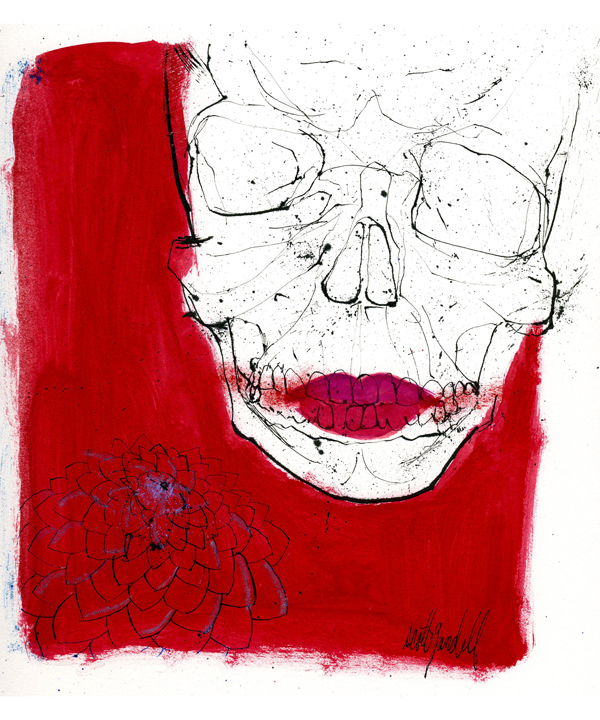 The project is an exhibit entitled ELIZABETH, and it is comprised of material used in the investigation of the most infamous unsolved homicide in Los Angeles’ history, the 1947 mutilation slaying of Elizabeth Short, The Black Dahlia. 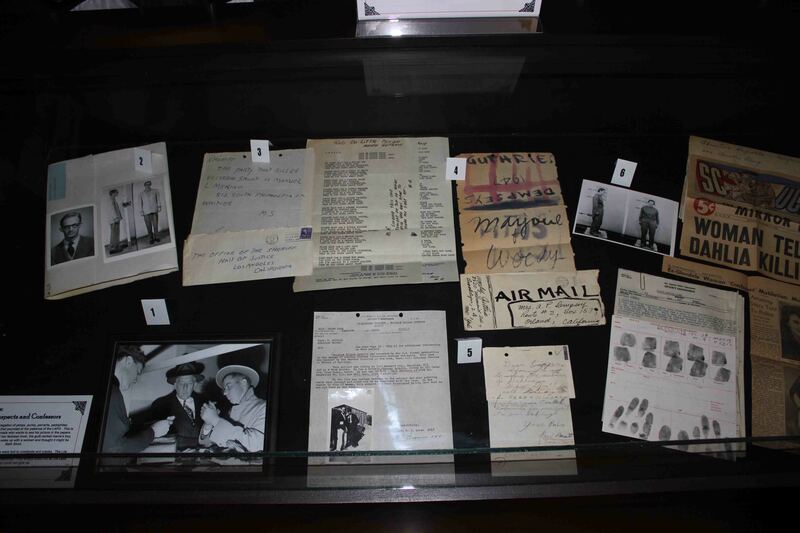 LAPD Chief, Charlie Beck, gave the Los Angeles Police Museum unprecedented access to the files in the 65 year old Black Dahlia case; and from those files we selected artifacts that represent the depth and breadth of the investigation mounted by the LAPD six decades ago. The museum owes a debt to novelist James Ellroy, who has played a crucial role in getting previously unseen material in the Black Dahlia case to the public for this exhibit. Being able to examine files kept by the detectives who originally investigated Elizabeth Short’s murder has been a phenomenal experience for me. Everything I saw and read made an impression on me, but it was the scope of the initial investigation that stunned me. We identified 329 individual officers who knocked on the doors of well over 10,000 separate addresses that were scrupulously recorded! Failure to locate the crime scene and identify and apprehend the killer was never due to a lack of willingness on the part of the LAPD to allocate resources to the investigation. The manpower expended on the search for Short’s slayer was staggering. Among the items that we discovered in the files was an envelope filled with photographs of Elizabeth Short taken in Hollywood on a summer day in 1946, a few months before she was murdered. The photos were taken by a young man, a former soldier, she’d met while she was living in Long Beach. Beth and the young man spent a day in Hollywood seeing the sites and taking pictures. 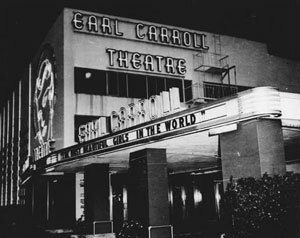 In one of the photos Beth is posed beneath the marquee of the Earl Carroll Theater which declared “The Most Beautiful Girls in the World”. The young man was obviously smitten with Beth’s loveliness. 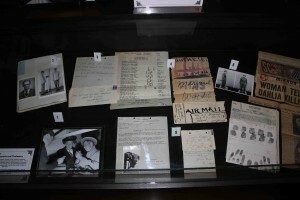 Not all of the photos taken of Beth that day in Hollywood are on display at the museum; however, what’s there is a representative sample of what we discovered. The photos wouldn’t come to the attention of the police until 1951 when the man was busted for beating his wife. In his statement to LAPD detectives he said that he and a friend, who had also known Elizabeth Short in Long Beach, had considered coming forward immediately following the news of her murder, but they’d decided not to get involved. The man may have been guilty of spousal battery, but he was eliminated as a suspect in Short’s murder. And what, you may well ask, does the murder of the Black Dahlia have to do with vintage cosmetics ephemera? 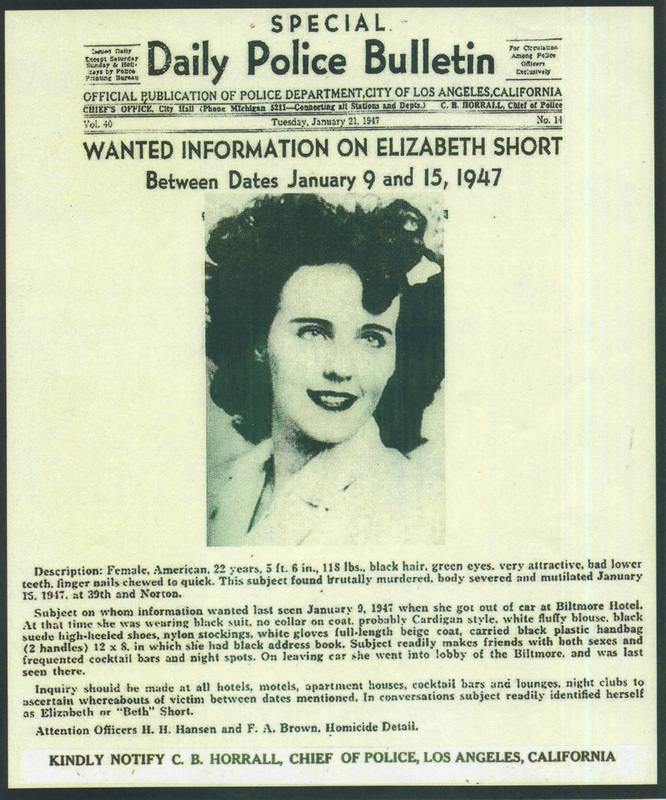 As a tour guide for the Los Angeles based company ESOTOURIC, I have created a personality profile of Elizabeth Short based upon her make-up for THE REAL BLACK DAHLIA tour. Yes indeed, when there is a way to combine my twin passions of historic Los Angeles crime with vintage cosmetics ephemera I’m all over it! A few years ago I was rereading some of the original newspaper coverage of Short’s murder and I was intrigued by a comment made by one of her roommates, Linda Rohr. 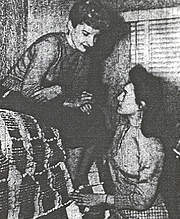 Linda was one of the women with whom Beth Short shared an apartment on Cherokee near Hollywood Blvd. 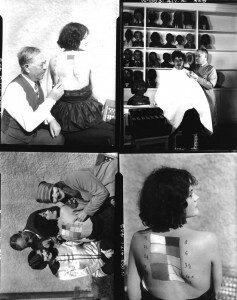 Rohr, a worker in the “Rouge Room” at Max Factor in Hollywood, stated that she was fascinated by the way in which Beth Short applied her make-up. 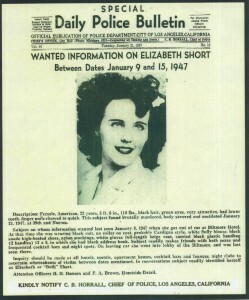 According to Rohr, “She had pretty blue eyes but sometimes I think she overdid with make-up an inch thick.” She went on to describe Elizabeth Short’s finished look as startling and almost geisha-like. Rohr’s description of Beth Short’s make-up caused me to wonder exactly what Beth was trying to accomplish with her look. During the post-war era women used make-up to enhance their natural beauty, not to alter it. Women such as actress Ingrid Bergman personified the ideal of natural beauty that was so popular at the time. Beth Short lived decades too early for a Goth look, yet her reported penchant for make-up a shade or two lighter than her natural skin tone would give her more in common with Morticia, or Dita Von Teese, than with her contemporaries. In my eyes the fact that Linda Rohr worked at Max Factor imbued her observations on Beth’s make-up with a degree of professional credibility – this was a woman who was familiar with current trends in cosmetics and their application. As a result of Linda’s description, I concluded that Beth was using her make-up as a mask, a way in which to keep people at arm’s length. I don’t think that it was a conscious decision; I believe that without ever realizing it Beth created the character she would become in death, the Black Dahlia. And I also believe that her distinctive look played a crucial role in her abduction and subsequent slaying. I don’t mean to suggest that Elizabeth Short deserved her death, or that she brought it upon herself, only that her killer was drawn to her because she fulfilled the criteria for his (or her) perverse desires. 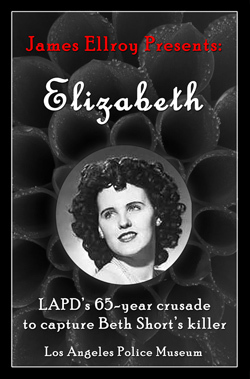 For more on my personality sketch of Elizabeth Short hop aboard Esotouric’s crime bus for the next THE REAL BLACK DAHLIA tour (April 14, 2012). This particular tour is always a sell out so purchase your ticket soon! I highly recommend that you visit the Los Angeles Police Museum to see the Black Dahlia exhibit. 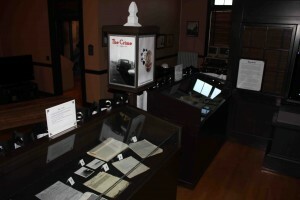 The exhibit opened Monday, March 19, 2012 and will run through Saturday, June 16, 2012.